An eight-year-old Shane Hogan was in middle of the thousands of GAA fans gathered in the Bronx that day who saw New York eventually lose 0-14 to 0-12. The experience and excitement left a lasting impression. "I remember sitting here when Leitrim came out a number of years back and New York brought them into overtime. I remember just looking at them thinking, 'I wanna be one of the guys on the field one day playing against teams like that'." As the 2018 football championship gets under way, Hogan will be doing exactly that, having established himself as a key player on a home side that hopes to cause one of the biggest ever GAA upsets. Now 23, and a New Yorker to the core, this is not his first rodeo. 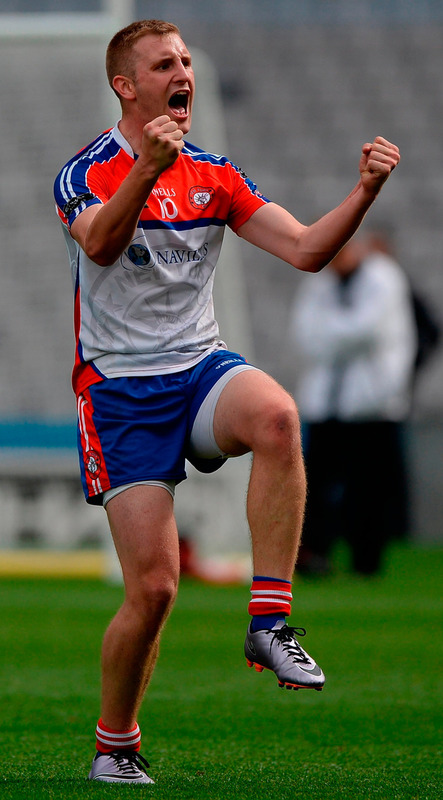 In 2012, and still just 17 years of age, Hogan was thrown in at the deep end and made his senior bow against Sligo. "I kept plucking away over the years at 10s, 12s, 14s, 16s and had to just keep getting better and graduating to a higher level. Thankfully, one day I got the call from the senior manager and took my chance. "The day before the game we were doing a talking session and they were like, 'Shane, you are going to marking Charlie Harrison' and I was asking people who Charlie Harrison was because I wouldn't have seen much of Sligo playing. Obviously he is a very good football player and I thought it was just what I wanted but after the first five minutes, Charlie took off like a racehorse and I knew that this was a different kind of standard. "I was wondering then if I was even good enough to play at this level because at half-time in that match I was taken off. It shook me for a little while but now I think I am at a level where I can compete," says Hogan. While making his debut is something he will forever cherish, the result that day was not one to remember. New York were blown away 3-21 to 0-6 but rather than be deterred, Hogan saw that match as the start of a dream rather than the end. Since then, he has become a trailblazer and a hero to many young GAA fans in his city. "To get that first experience was vastly important for someone like me and the couple of other players that were with me as there was four of five American players on the panel that day. "You can go into any part of New York now, you can go to Queens, Brooklyn, Manhattan and especially Woodlawn and there will be somebody there who knows the GAA and who plays. You will always feel like you are not alone even if you are in a new place. When I see kids who are able to recognise who I am, I just fill up with a great sense of pride and I really hope that one day they can do what I am doing now and represent New York." As the number of underage teams and players grows on this side of the Atlantic, so too has the expectation around the New York senior team. Two years ago, Roscommon escaped with the narrowest of victories while last time out, Sligo trailed in the second half before pulling away in the final quarter. "A lot of people would say it [the Roscommon game] was a positive experience but the next day we were all just looking at each other thinking that we could have done it. We thought we could only build from that experience. We came so close to beating a team like that and I'd say it probably woke up the teams in Ireland a bit more that come out here. When I first started, they saw New York as just a game where you can go and have some fun." New York's plans to beat Leitrim are aided by players like Tom Cunniffe (Mayo), Jamie Clarke (Armagh), Kevin O'Grady (Wexford) and Neil Collins (Roscommon). Hogan is very much looking forward to embracing the energy and excitement of the occasion. "I always look forward to this day; it's always one of the best days of the year. Tom Cunniffe has vast experience with Mayo and Jamie Clarke with Armagh. The two of them are definitely spearheading the mindset in the locker-room and keeping us calm, composed and getting ready. You'd see these guys while we were growing up, playing for Mayo or Armagh in All-Ireland quarter-finals, semi-finals and even All-Irelands and to see they are nice, normal guys that are willing to do anything to help you out is a wonderful thing." Unlike all the inter-county teams in Ireland, New York have no league campaign to help their preparations for the summer adventure but the group have focused on making that a positive and embraced the unique challenges they face. Football out here it is very much played with a smile on the face. "We are a close group and one thing that we can take away as a positive is that we are the great unknown. Of course people know what Jamie and Tom are about but they don't know much about the other boys. "A win is needed if we are going to make the next step and say we deserve our shot in the league or having more teams come out to play us. It would be a great boost to the kids out here because if they are watching you get hammered every year or lose over and over again then they sort of lose interest. So for them and for us mentally, it would be tremendous." There is a real belief that if they can get a win here, they can get one anywhere. It's up to you New York.